1. Quiz: Which country has a flag which is a white cross on a red background? 2. Quiz: What is the name of the traditional Japanese style of fencing with wooden swords? 3. Quiz: What is Altamira in northern Spain famous for? Caves with pre-historic paintings and engravings. 4. Quiz: In 1936 Gandhi shifted his ashram to Segaon from Sabarmati. What new name did Gandhi give the village? 5. Quiz: Plato taught in an olive grove outside Athens. It became a kind of school. What was it called? 6. Quiz: In ancient Greek city states the central district would be built on a hilltop and it would contain the chief municipal and religious buildings. What was this place called? 7. Quiz: Who are the legendary founders of Rome? 8. Quiz: What are the most reliable industrial shares on a stock exchange called? 9. Quiz: Where is Neanderthal? 10. Quiz: Which Greek statesman is called 'the father of democracy'? 11. Quiz: Jan Paderewski was already famous when he became Poland's first Prime Minister in 1917. As what? 12. Quiz: 'Unfriend' is an expression associated with Facebook. Who first used the expression 'unperson'? 13. Quiz: Over which river does Trajan's river span? 14. Quiz: Who is the Wen Ti? 15. Quiz: What is Fabian socialism? Socialism through reform rather than through violence and revolution. 16. Quiz: For whom was the supreme principal of morality the" categorical imperative"? 17. Quiz: What is the Law of Economy or the Law of Parsimony better known as? 18. Quiz: What was Fleet Street famous for? 19. Quiz: Name India's equivalent of Wall St, New York City. 20. Quiz: Which two bodies of land are separated by the Strait of Messina? 21. Quiz: Name the three Pakistani cities which have served as capitals since independence. 22. Quiz: What is the language of the Gypsies? 23. Quiz: In law what is a subpoena? 24. Quiz: What is psychokinesis? 25. Quiz: Which sea surrounds the island of Majorca? 26. Quiz: Which is the world's smallest ocean? 27. Quiz: Who is the chief law officer of a state in India? 28. Quiz: In Spain live a race of people who call themselves Euskotarak. The Spanish call them Vascos or Vascongadas. What is their more popular name? 29. 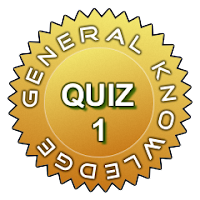 Quiz: An American psychologist John Broadus Watson founded a school of psychology. Name it. 30. Quiz: What in architecture is a setback?